I’m going ALL-OUT on Thursday and a recipe for Thanksgiving Fried Rice. Thanksgiving dinner is one of my most favorite meals of the year. It has stiff competition in an Italian household, where Christmas and Easter are ruled by traditional recipes that are complex, exotic, and amazingly delicious. But at Thanksgiving, the truest of all American holidays, my family has always honored the customary menu of turkey, stuffing/dressing, mashed potatoes, corn, peas, salad, cranberry sauce, sweet potatoes, and pies (almost always one per person). You won’t see a ravioli or slice of prosciutto that day. Here we are – in just a few more days, Americans will be eating more tI urkey than anyone else in the world can imagine. The meal is savory, welcomingly heavy, and after the annual ritual of non-stop gorging, we rest, sleep, and some us even snore. All while being incredibly grateful. I’ve lost about 80 pounds in 2 and a half years by exercising, eating better, avoiding processed foods as much as possible, and rarely, if ever, eating fast-food. I indulge, of course, and Thursday is going to be NO exception. I’m going ALL-OUT. Until then, I’m not going to starve myself or eat a leaf of spinach for every meal. I’m going to whet my apetite with healthy, filling, flavorful lunches, perfect for the colder temperatures, and keeping me fit so I can truly indulge, and enjoy, this Thursday’s feast. 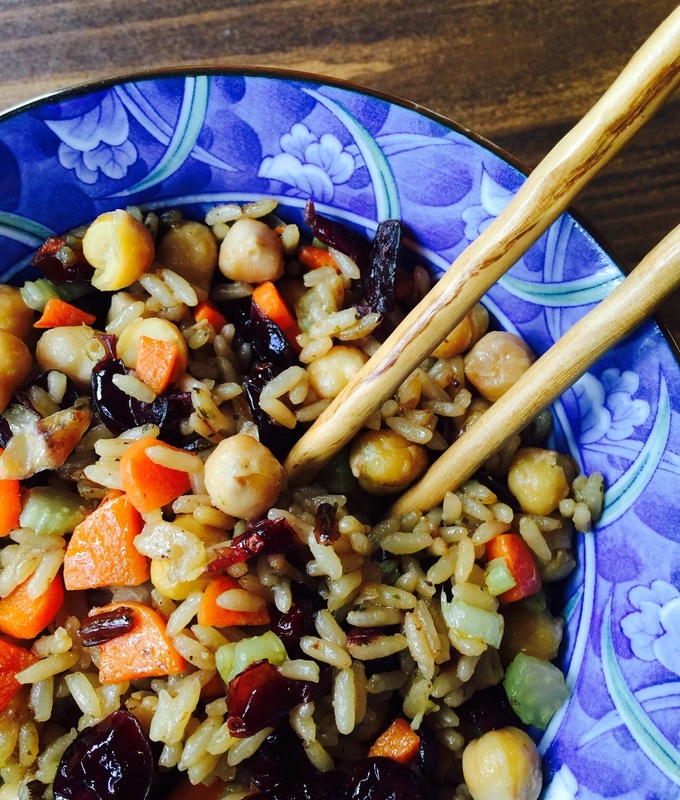 Here is my Thanksgiving Fried Rice – you can add, modify this basic and simple recipe. It makes a great lunch on its own followed by a piece of fruit. I’m super busy so I really love Uncle Ben’s Ready Rices. They take 90 seconds. Of course, you can cook rice and substitute with your favorite. You’ll need about 1 1/2 cups, cooked. To a heated skillet, add the olive oil, celery, carrot, and onion. Saute for a few minutes until tender. Add cranberries and continue to saute over medium-high heat for a few more minutes. Add Garbanzo beans and rice, salt and pepper (I used 1/4 tsp. each) and stir-fry for about 5 minutes. An easy, healthy, delicious, satisfying, and most importantly, fast lunch that you could also make the day before and take to work the next day.